These are great fun. They are vintage from at least the 1970's to 1980's. The barrel shaped beads are a turquoise blue plastic with brass connector loops attached. Some of the beads have a swirled pattern. 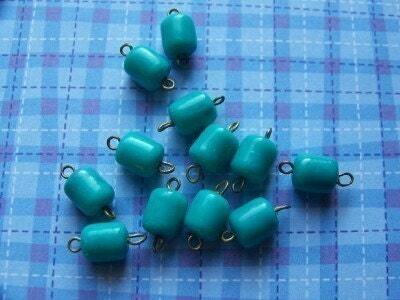 These are a great weight to make earrings, make chains, use as a charm or drop. These measure 15mm X 8mm. You will receive 12 of these.